Bernie Moran (Allen Garfield): That’s terrific! The bugger got bugged. Again, I rewind the opening scene. Bird’s-eye view: a monument in a public square that is front and center in the frame but with the top-third of its Corinthian column cut from view. Look closer. But where? Relax, Dr. Watson, relax. The work of a detective requires patience and a keen eye. Help is on the way. The endeavor of finding the yet-to-be-revealed focal point is appreciatively aided by Francis Ford Coppola’s lens slowly zooming in. It is an innocuously beautiful day, sunny, undeterred in its pace with people milling casually about. Supposition of tranquility is adequately supported by the sounds of the day: the excited barking of dogs at play, the squeal from a sidewalk saxophone syncopating nicely with the strolling crowd, a smattering of applause at the end of the song announcing the start of another. Wake up, sings the singer. Wake up, wake up, you sleepy head. But a strange feeling sinks in. Something creepy is going down. Although on the surface, nothing appears out of the ordinary, a dark unsettling tone is nevertheless choreographed in conjunction with the camera’s deliberate movement and the mundane yet mysterious symphony of everyday sounds that are juxtaposed against the sudden interruption of something entirely out of place: jumbled audio. A mime attracts my attention. I rewind again, this time watching the mime from the start, studying his exaggerated theatrics as he prances about looking for his next victim. Whose private moment on this peaceful day will be stolen so that the mime can incorporate the ensuing silent exchange into his running theater of imitation? And so it is that we are introduced at last to the still very faraway figure played by Gene Hackman, although we do not yet know that he is anything more than a man in the crowd. We do not know yet that he is Harry Caul, a professional eavesdropper. We do not know that he is not actually the person or persons of interest. And we also do not notice, at least until subsequent viewings, that a delicious irony is presented when an eavesdropper on assignment has his own privacy invaded by a mime. Returning, the garbled sound of jumbled audio sounds menacing. Scratch that. The jumbled audio sounds menacing. The garbled sound of jumbled audio menaces, reminding us that we are very much watchers here, like the men with the headphones and spying equipment. In this captivating opening scene—a scene whose audio will be replayed and reanalyzed over and over throughout the film—an otherwise peaceful if not mundane day is remarkably neither, replaced instead by an ominous foreboding as the scene within the scene begins to reveal itself. Ann (Cindy Williams): Oh look, that’s terrible. Mark (Frederic Forrest): He’s not hurting anyone. Ann: Neither are we. Oh, God. Pause. I scribble down notes that will later be transcribed into what you are reading now. Ann: I always think that he was once somebody’s baby boy. I do. I think, he was once somebody’s baby boy and he had a mother and father who loved him. And now there he is, half dead on a park bench and where are his mother and father or all his uncles now? Target marked. The couple in question—the subjects—are, however, not to be killed (not yet?) although you would be forgiven for thinking so, considering their introduction in the film comes through a viewfinder’s crosshairs. But the man doing the aiming is wearing headphones and the gun is actually not a gun but a booming microphone. It is their conversation that is the real prize here. Stan (John Cazale): Sometimes it’s nice to know what they’re saying. 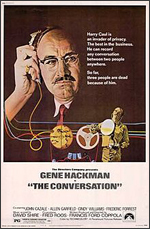 Harry Caul (Gene Hackman): I don’t care what they’re talking about. All I want is a nice fat recording. The couple thinks their conversation is private as they walk in circles around the park. They are taking precautions. But someone is listening. Ann: Did you see him, that man with the hearing aid, like Charles? Ann: Right there with the shopping bag. Stan: [from inside a nearby van] Well, that’s it for Paul. They spotted him. Ann: He’s been following us all around. Under an ADT security sticker, Harry Caul uses two separate keys for two separate deadbolts and then a third key to finally release the door lock. And all of these precautions are for an apartment that is inside a building that houses many other units. Is the neighborhood that unsafe? Is Harry just being extra careful? One thing is certain: we are on high alert. There is a presumption of danger. Replaying an audio excerpt from the opening scene (as Harry and I both do) confirms as much. Mark: He’d kill us if he got the chance. The rising tension of the film is marvelously infused if not mirrored by an atmosphere of growing paranoia that is inescapable. Even when you think a detour into Caul’s private life will provide a break—away from the mysterious case of the couple in the park—you soon realize that for someone like Caul, there can really be no escaping. Amy (Teri Garr): Like, tell me about yourself. Your secrets. Harry: I don’t have any secrets. Amy: I’m your secret. You do have secrets, Harry. I know you do. When you build a life around the profession of eavesdropping, how can you ever hope to turn off the recording that is running on loop inside your ever-suspicious mind? Amy: You think you’re going to catch me at something. An interesting aspect of the film’s subject matter is that you are never quite sure where the recordings start and stop or where the paranoia is justified or not. Amy: Sometimes I even think you’re listening to my when I’m talking on the telephone. Amy: I don’t know. I just feel it. Really, I do. Delving deeper and deeper into the film’s mysteries, we begin to realize that the couple in the park are not the only subjects. As moviegoers, we are granted omnipresent access into Harry’s secret world. Harry: It has nothing to do with me and even less to do with you. Stan: It’s curiosity. Did you ever hear of that? It’s just goddamned human nature. Harry: Listen. If there’s one surefire rule that I have learned in this business it’s that I don’t know anything about human nature. I don’t know anything about curiosity. I don’t … It’s not part of what I do. And as we continue to eavesdrop into Harry’s private life, we become privy to Harry’s increasing paranoia and moral conflicts. Struck by a revelation regarding the film’s unintentional ties to current events, I pause the DVD once again and I write three letters down on my notepad before quickly scratching them out. Stan: Who’s interested in these two anyway? NSA No need to stir up any unnecessary trouble for myself. Martin Stett (Harrison Ford): [on the phone] We’ll be listening to you.